Congratulations to Sheryl K.!! She was in my class at A Quilter’s Affair in July, and entered her Color Wheel Footstool into her local county fair, taking Best of Show! Not surprising to me, as the fabric choices and construction are perfection. What a way to celebrate the end of summer with a great project! 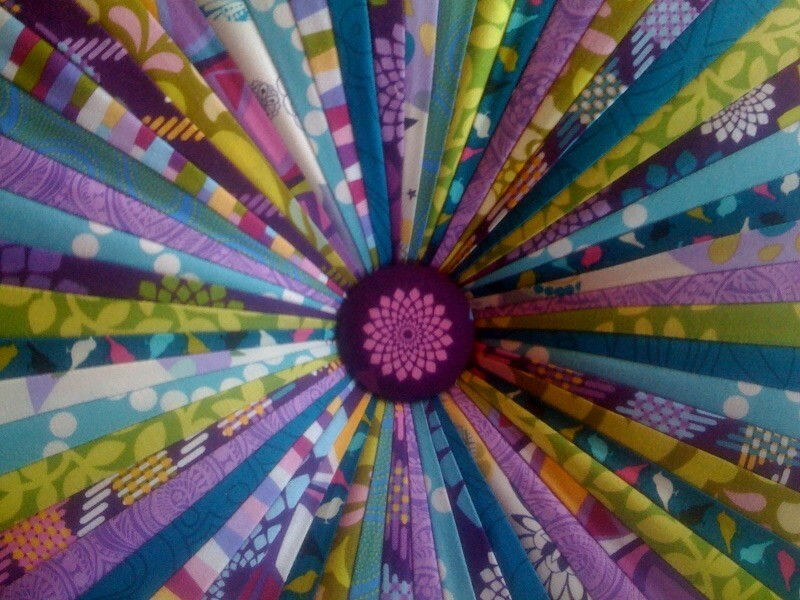 You can get a kit for the Color Wheel Footstool in my SHOP, and then watch the video tutorial about foundation piecing the strips. It is wonderful to see this three dimensional project blossom! Next Footstool Class: Bandon, Oregon! That’s right! I’m headed back to see all my coastie buddies! I’ll be at Forget Me Knots in Bandon, Oregon with Michelle and her crew. Such a wonderful shop/retreat center and in a great location. I think next Saturday 1/14/17, will be the perfect day to start a footstool! Here’s what happens: The class is taught in two parts. The first class on the 14th, you will learn how to foundation piece the panels used to make the footstool “upholstery”. By the end of class you’ll be totally ready to finish the homework and come back in two weeks. Then, on the 28th we will get together again to build the footstool! I bring all the tools and the kits. 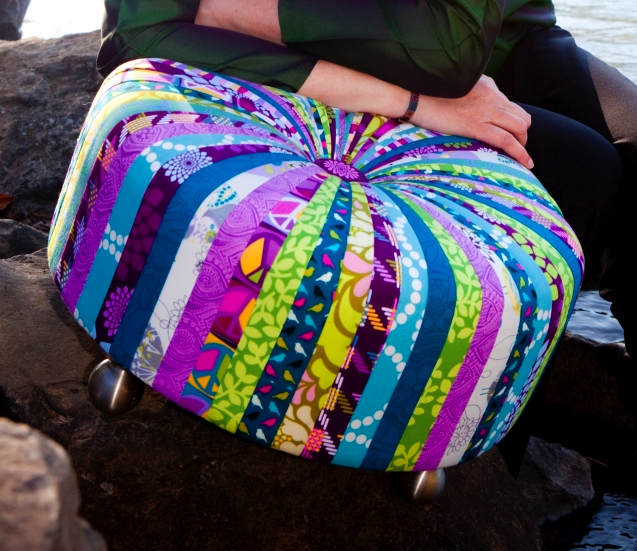 It is a remarkable day as these wonderful pieces of fabric blossom into a finished footstool! It is so fun to see all the happy faces at the end of class. If you can’t make the class, or live in another location I’d love to come to YOU! You can also see my SHOP page to purchase a kit and I can send it off tomorrow! Don’t forget to follow me! See the Bloglovin button in the upper right corner. How much do you LOVE this footstool made by my friend Pam!!!! I can’t get over the sophisticated look she got out of some recycled sweaters! Here’s what happened: A VERY talented group of women in Seattle found a wonderful way to support Green Eileen, by participating in the Chop Challenge! The challenge is to create an auction piece by using materials which have been provided from donated clothing. Please go to the Green Eileen website to find out more, and to see the events coming up soon in the Seattle area, including the “Chop Challenge” on October 3rd from 5-8pm. In the meantime, let me explain that Pam used her creativity, imagination, and one of my footstool kits to make this piece for the auction! I don’t know how she will be able to give it up! Seriously!! I may have to copy her idea! You can too, by ordering a kit from my “Shop” page, and adding your own collection of recycled materials! International shipping for Footstool Kits! I have finally been able to find a reasonable price for international shipping, at least for Canada, the UK and Australia–where I’ve had inquiries. I will be able to add these into the shop buy buttons soon, but in the meantime, if you want to shoot me an email I’d be happy to answer any questions! There is a SIGNIFICANT price break for shipping two kits, so hopefully you will have a friend who’s interested too! The latest footstool class started up yesterday at Piece By Piece in Eugene! What a fun group! Everyone is making so much progress with their sewing. The first class is centered around learning how to make the “upholstery” for the footstool, as well as getting to know each other, seeing everyone’s fabric choices, and plenty of laughter and encouragement all around. The sewing machines were humming, and the conversation was lively! We’ll get back together in two weeks to actually construct the footstool! There’s a little homework to be ready for that class, and that day is so remarkable! Everyone will go home with a completed project! I truly cannot wait to see them finished, stay tuned for more pictures of that day. Of course you know you can make one for yourself by ordering the kit! It comes with a 9-page instruction booklet and all the “parts” you’ll need. Of course you get to choose your own fabric, feet and decorative button to personalize it. Scroll down on my shop page to find it here! Footstool classes coming up soon! 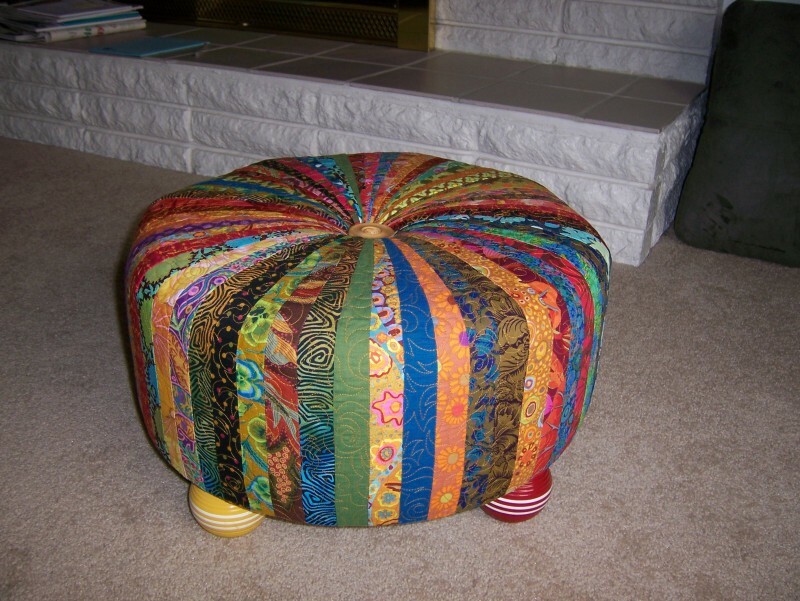 My footstools always get a lot of attention, and YES they are a fun addition to my classes. I teach the class over two days, generally about 2 weeks apart (since there is homework to do between the classes). The classes are so fun! At the end of the second class you end up with a FINISHED project, not something you have to take home to finish! Of course I’ve seen it done in dozens of different fabric collections and from cotton, flannel, silk ties, fleece, home dec fabrics and corduroy! There are a couple of opportunities coming up soon to join a class! For any of you in the Roseburg, Oregon area, call The Country Lady quilt shop for a class scheduled March 30th and April 13th. Just a few weeks later there will be a class in Eugene, Oregon at Piece By Piece on May 4th and 18th. I’d love to see you at either of these classes. They tend to sell out and have a waiting list, so don’t wait too long to join the fun!